On a crisp mid-October day in 1984, Alan Trammell played a key role in putting the Detroit Tigers on the verge of the World Series championship their fans and city had been waiting for since the “Sock It to ’Em Tigers” team of 1968 upended the St. Louis Cardinals. The Tigers led their National League opponent, the San Diego Padres, two games to one as the teams prepared for Game Four at Tiger Stadium. The teams had split the first two games in San Diego, and the Tigers pulled ahead by winning Game Three. Game Four proved to be a pivotal point in the Series. As happened often during the Tigers’ magical season, they pulled ahead in the first inning when Lou Whitaker reached on an error and Trammell smacked a home run into the left-field seats. In the third inning, Whitaker reached again, on a single, and as more than 52,000 fans in the historic ballpark roared, Trammell again stepped to the plate attempting to add his name to the list of Tigers legends. Trammell was up to the task and hit a home run into the upper deck — a hit that all but cemented the Series for the Tigers. Jack Morris held on for the win, and the next day Kirk Gibson put the finishing touches on the Tigers’ first championship in 16 years. Based on his consistency and heroics, “Tram” was named the Series’ Most Valuable Player, a well-deserved honor. Trammell was elected to the Baseball Hall of Fame by the Modern Era Committee as part of the Class of 2018. Alan Stuart Trammell was born on February 21, 1958, in Garden Grove, California, near Anaheim and a stone’s throw from Disneyland, to Forrest and Anne Trammell. He grew up as a fan of the Padres and as a teenager worked as a vendor at San Diego Chargers football games and professional soccer matches at San Diego Stadium (the name of which was changed in 1980 to Jack Murphy Stadium). Trammell and his friends often sneaked into Padres games by getting there early and just “hanging out” until game time. From a young age, Trammell was involved in sports. At Kearney High School, he focused on basketball and baseball, with basketball being his first choice. He received basketball scholarship offers from some colleges to play point guard. Although talented, he was humble about his abilities, much as he would be with the Tigers. Brad Griffith, a coach at Kearney High, said, “He was a great athlete, but was always humble, didn’t go around projecting himself as the big man on campus.” Trammell was named to the California Interscholastic Team in both basketball and baseball. Jack Taylor, his high school baseball coach, remembered Trammell’s work ethic: Most scouts who saw him wondered if he would ever be able to hit well enough, but Trammell worked hard at improving his skills at the plate. From scores in the 42-48 range given initially by scouts for the Major League Scouting Bureau (the bureau scores prospects on a 20-80 scale with a score of 55 indicating major-league ability) his scores improved to as high as 58.6. After playing in the state all-star baseball game, Trammell began his professional career two days later, as a shortstop with the Bristol (Virginia) Tigers in the Rookie-level Appalachian League, where he hit .271 in 41 games and played in the league all-star game. Toward the end of the season, he bypassed Class A altogether and was moved up to the Double-A Montgomery Rebels in the Southern League, where the 18-year-old hit only .179 in 21 games. Despite his low batting average, the Tigers saw his potential. Defensively, he was quite advanced, and as he developed physically, Detroit figured his batting would improve. That fall, he was sent to the Instructional League in Florida and met Lou Whitaker for the first time. They were roommates at the Edgewater Hotel in St. Petersburg and became, if not inseparable, then joined at the keystone sack. “The very first day, we clicked,” said Trammell. In 1977, he began the season at Montgomery, where he played shortstop and Whitaker second base -- the start of a long-standing double-play combination. Trammell hit .291 in 134 games with 50 RBIs and 19 triples, which broke the league record set by Reggie Jackson 10 years earlier. (Oddly, he had only 9 doubles.) He was named the league’s Most Valuable Player. Montgomery won the league championship over Jacksonville; the day after the clincher, Trammell was called up to the Tigers. Trammell and Whitaker made their major-league debuts on September 9; at a little over 19½ years old, Trammell was the youngest player in the league. Whitaker was 20 years and 4 months old. Whitaker batted second and Trammell ninth as both collected their first big-league hits off veteran Boston right-hander Reggie Cleveland. Trammell singled to center field in the third inning, and added another single in the sixth inning off Rick Wise. Trammell scored his first big-league run in the contest, and handled two chances in the field flawlessly. On February 21, 1978, his 20th birthday, Alan married Barbara Leverett. They had met during his sophomore year in high school, but didn’t begin dating until he was a senior. They had three children, Lance (named after Lance Parrish), Kyle, and Jade Lynn. When the 1978 season started, Detroit manager Ralph Houk gave Trammell and Whitaker the opportunity to start for the Tigers, and they responded with good seasons. Houk spoke highly of his young duo: “Those two kids, they just play good every day. They’re the best I’ve ever seen for their age. On the double plays, knowing where the ball is going to be, that’s something you can’t teach.” Whitaker won the American League Rookie of the Year award, while Trammell finished fourth in the voting. Trammell finished with a batting average of .268 with 2 home runs, 34 RBIs, and 49 runs scored. On July 7, against the Texas Rangers at Arlington, he went 5-for-6, with a double, two RBIs, and two runs scored. Trammell and Whitaker led the league in double plays at their position. Each took part in 95 twin killings -- although they weren’t always involved in the same 95. Over the next few years after his debut season, Trammell worked to maintain his stellar fielding and increase his prowess at the plate. He worked at being able to hit the ball to all parts of the field and to become stronger, eventually filling out to 175 pounds on his 6-foot frame. Along with adding strength, Trammell was able to maintain his quickness, which could be seen by his steal of home against the Oakland Athletics on June 12, 1979, at Tiger Stadium off right-hander Dave Heaverlo -- the first steal of home for a Tiger since 38-year-old Al Kaline did it in 1973. In 1980, Trammell had his breakout year. He batted .300 with 168 hits, 9 home runs, 65 RBIs, and 107 runs scored. He earned the first of his six trips to the All-Star Game. Fielding at a .980 pace and making only 13 errors, he received his first Gold Glove, the first for a Tiger since Aurelio Rodriguez in 1976 and the first for a Detroit shortstop since Brinkman in 1972. After the season, Trammell signed a seven-year, $2.8 million contract, paving the way for a long-term stay in Detroit. In both 1981 and ’82, Trammell’s average fell to .258, but in the strike-shortened ’81 season, he won another Gold Glove by committing only nine errors for a .983 fielding percentage. In 1983, he bounced back to have his best year yet, batting .319 with 14 homers and 66 RBIs. His average was good enough for fourth in the American League, one point behind his keystone partner Whitaker. He also won a Gold Glove again with a .979 fielding average and only 13 errors, and won The Sporting News’ American League Comeback Player of the Year Award. It was the first of two consecutive seasons in which Trammell and Whitaker won Gold Gloves at the same time; only eight other shortstop-second base combinations have won the award in the same year. Trammell, along with Whitaker, made his acting debut, so to speak, during the offseason as well. The television show Magnum P.I., starring native Detroiter Tom Selleck, filmed an episode showcasing Selleck’s love of the Tigers in which his character makes a trip to Detroit. It was actually filmed in Hawaii and featured Trammell and Whitaker in a scene. As Trammell had been developing over the previous few years, the Tigers had been maturing as well. Beginning with the 1978 season under Houk, the Tigers put together an 11-year string of winning seasons. Houk retired after 1978, and Sparky Anderson, who had won two World Series titles with Cincinnati’s Big Red Machine ballclubs during the 1970s, took over for Les Moss midway through the 1979 season. Anderson, along with a group of talented players, took the Tigers to the next level. They flirted with the playoffs in the strike-shortened 1981 season and finished second behind the Baltimore Orioles in 1983, but 1984 definitively became the Year of the Tiger. Trammell suffered an embarrassing injury after the 1983 season. He and his wife attended a Halloween party and Trammell was wearing extra-tall Frankenstein boots to go with his costume and fell into some bushes. At the time, he wasn’t sure if he’d hurt himself, but during offseason workouts in San Diego, his knee didn’t feel right. He ended up having arthroscopic surgery on his left knee in November. He worked hard at his rehabilitation and was ready to go for the start of spring training in 1984. Detroit jumped out to a 35-5 record to start the 1984 season, winning its first nine games and 16 of its first 17. During the Tigers’ hot start, Trammell was at the front of the pack with a .403 batting average in April from his No. 2 spot in the batting order. Trammell had become accustomed to the more closed stance that hitting coach Gates Brown had been working with him to develop since the previous year. With Whitaker leading off and Trammell behind him, the Tigers jumped out to many early leads and prompted Sparky Anderson to say, “Whitaker and Trammell -- they’re the key to our ballclub.” The Tigers captured the American League East title with 104 wins. Trammell finished the season with a .314 batting average, 14 home runs, 85 runs scored, and 69 RBIs. He won his fourth Gold Glove in five years and was selected to the American League All-Star Team, although he didn’t get into the game in San Francisco. The Tigers swept the Kansas City Royals in three games in the American League Championship Series. Trammel hit .364, with a homer in Game One. In the World Series, Detroit faced Trammell’s boyhood team, the San Diego Padres. After splitting the first two games in San Diego, the Tigers returned home to Detroit and took the next three games to win the Series four games to one and become world champions for the first time since 1968. Trammell won the World Series Most Valuable Player Award. He batted .450, with nine hits and six RBIs in the five games. He hit two home runs in Game Four. After the Series, Trammell had surgery on the knee he injured the previous Halloween, and on his shoulder, which had bothered him more as the season wore on. The World Series triumph made rehabilitation a little easier to take during the offseason. The next couple of seasons saw the Tigers continue winning, but unable to break into the postseason. Trammell’s average dropped to .258 in 1985, but he was selected for the All-Star Game in Minnesota. He got his first All-Star at-bat, but failed to get a hit. In 1986, his average rose to .277 and he hit 21 home runs. Third baseman Darnell Coles said he thought Trammell was the most important player on the team. “That’s because of his consistency,” said Coles. “He’s always out there, he always knows what’s going on, he’s always talking. 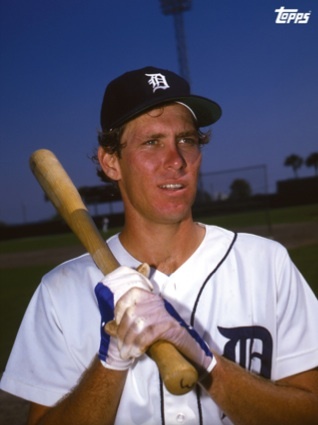 He keeps everybody going.” Trammell became only the second Tiger to have at least 20 homers and 20 stolen bases in the same season, and he repeated the feat in 1987. Kirk Gibson had been the first Tiger to accomplish the feat, doing so four years in a row (1984-87), and Curtis Granderson has since accomplished it as well. In 1987, Sparky Anderson asked Trammell to bat cleanup. He responded with the best season of his career and carried the Tigers to the division title as they swept the season-ending three-game series at home over the Toronto Blue Jays and won the division title over Toronto by two games. Trammell had 205 hits for a .343 average with 28 home runs, 105 RBIs, 21 stolen bases, and 109 runs scored. He became the first Tiger to collect 200 hits and 100 RBIs since Al Kaline in 1955; and his RBI mark was also a record for Tiger shortstops. He made his fourth All-Star team (slated to start in 1984, he had sat out the game due to injury), reaching safely on an error in his only at-bat. Trammell won his first Sporting News Silver Slugger award, given to the best hitter at each position. He was nosed out by George Bell of Toronto for the MVP award in one of the most controversial votes in history. Bell had slumped at the worst time possible -- two showdown series in the season’s final two weekends against Detroit, with each game decided by one run -- while Trammell had carried the Tigers to the title by hitting .416 with 6 homers and 17 RBIs in September. Despite this, Bell got 332 points to 311 for Trammell. His teammate Lou Whitaker had taken second base up after the last game and wrote “To Alan Trammell, 1987 AL MVP. From Lou Whitaker” as an indication of his sentiments. The Tigers were eliminated by the upstart Minnesota Twins in five games in the ALCS. Trammell hit just .200. In 1988, Trammell batted .311 with 15 home runs and 69 RBIs as the Tigers finished one game behind the Boston Red Sox for the AL East Division title. He was selected as the starting shortstop for the All-Star team, but did not appear because of an elbow injury. He earned his second consecutive Silver Slugger award. The 1989 season saw Trammell battle injuries and bat just .243. Detroit also fell to last place in the division, 30 games behind Toronto. That broke an 11-year streak of winning seasons for the Tigers. In 1990, Trammell rebounded, finishing fourth in the league batting race. He hit.304 with 14 homers and 89 RBIs. He was selected for what turned out to be his final All-Star Game. He failed to get a hit in one at-bat at the game played at Chicago’s Wrigley Field. He won his third Silver Slugger award. Beginning in 1991, his 15th major-league season, Trammell’s playing time gradually began to drop off. Hobbled by knee and ankle injuries, he played in only 101 games that year and batted just .248. He collected his 2,000th major-league hit during the season, however. In 1992, he dealt with a nagging elbow injury and broke his ankle early in the season. He played in only 29 games and batted.275. In 1994 and 1995, both abbreviated because of the players’ strike, Trammell played 76 and 74 games, respectively, mostly at shortstop, and batted .267 and .269. On September 13, 1995, Trammell and Whitaker played in their 1,918th game together to surpass the American League record held by George Brett and Frank White of the Kansas City Royals. That season was Whitaker’s last; Trammell played one more year, 1996 (66 games, .233 BA). He played primarily shortstop, but also played second and third base and even an inning in left field. Perhaps in preparation for the future, she served as a player-coach for many of the younger, inexperienced Tigers. On June 25, Trammell reached a milestone by becoming the 10th Tiger to reach 1,000 RBIs in his career with an infield single against Oakland. After the season, Trammell retired as a player; he ended his playing career with a single up the middle in his last at-bat, just as he had in his first big-league at-bat. Trammell’s statistics stack up nicely against those of other Tigers greats. He, Ty Cobb and Al Kaline are the only Tigers to have played 20 seasons with the organization. (Only Cobb, Kaline, Whitaker, and Charlie Gehringer played in more games for the Tigers.) For his career, Trammell batted .285 with 185 home runs and 1,003 RBIs. He ranks in the top 10 in Tigers history in games played (2,293), hits (2,365), runs (1,231), doubles (412), and stolen bases (236). He was voted Tiger of the Year three times, was selected for the All-Star team six times, won three Silver Slugger Awards and four Gold Gloves. He had four consecutive-game hitting streaks of more than 20 games. Trammell hit at least .300 seven times, putting him in the company of Hall of Fame caliber shortstops. He finished with a fielding average of .976 -- .977 over 2,139 games at his primary position of shortstop. His uniform number 3 (he did wear 42 briefly in 1977) was not used until 2007 and 2008 when Gary Sheffield, with Trammell’s permission, wore it. At some point, Trammell’s number may be retired. Trammell and Whitaker were honored during a spring training game in 1997 and in Detroit on June 7 that season for their contributions during their careers. Retired as a player, Trammell stayed with the Tigers. In 1997 and 1998, he worked as an assistant to general manager Randy Smith, helping in scouting and player instruction. He also worked as a pregame analyst for a CBS Radio program, Inside Pitch. In 1999, Trammell returned to uniform as a coach for manager Larry Parrish, working as hitting coach and instructing the Tigers’ outfielders and baserunners. Before the 2000 season, the Tigers hired Phil Garner as their new manager, but failed to inform Trammell that he would not be asked back as a coach. Trammell found out through the media, souring the relationship between him and the organization. He moved on to a position as a first-base coach with his hometown Padres, whom he began following as an 11-year-old in 1969 in their first season as an expansion team. In 2002, Trammell appeared on the Hall of Fame ballot for the first time. The results were disappointing to many; he received only 15.7 percent of the vote, with 75 percent being needed to gain entry. In the seven subsequent years, he never received more than 18 percent of the vote. In 2001, The New Bill James Historical Baseball Abstract rated Trammell as the ninth best shortstop of all time, putting him ahead of 14 Hall of Fame shortstops. Upon his retirement, Trammell had more home runs and a higher fielding percentage than any shortstop then in the Hall. After falling off the writers' ballot, Trammell was finally elected to the Hall of Fame by the Modern Era Committee as part of the Class of 2018. He has also been inducted into the Michigan Sports Hall of Fame (2000) and the San Diego Hall of Champions’ Brietbard Hall of Fame (1998). Trammell also invited his longtime keystone partner, Lou Whitaker, to be a spring-training instructor at spring training in Lakeland, Florida. Whitaker lived nearby. Sparky Anderson also made his first appearance during spring training since retiring in 1995 to contribute some of his experience to what Trammell and Tigers were trying to accomplish. Still, in his first season, 2003, the Tigers hit rock-bottom with 119 losses. The team was made up of primarily older players and some talented youngsters who probably should have been getting their experience in the minors rather than in the major leagues. On top of the poor season in 2003, Trammell had to deal with the loss of his mother, who died of a heart attack in September. His parents had divorced when he was a teenager, and he was very close to his mother. He left the team for a few days to be with family in San Diego. In 2004, Trammell guided the Tigers to one of the biggest improvements in major-league history. They won 29 more games than the previous year, finishing at 72-90. Things seemed to be progressing on schedule for Trammell, but the 2005 season was disappointing. The Tigers finished at 71-91 as a late-season swoon dropped them out of contention. After the season, Trammell was let go as manager of his beloved Tigers. He was offered a position with the organization, but declined it. In 2006, the Tigers, with most of their players continuing the progress Trammell and his staff had begun, reached the World Series under new manager Jim Leyland, but lost to the St. Louis Cardinals. Trammell returned home to San Diego during the season and took a year off from baseball. He came back to be honored with Sparky Anderson before Game Two of the World Series in Detroit. He received a loud ovation from the capacity crowd at Comerica Park. In 2007, Chicago Cubs manager Lou Piniella hired Trammell to be his bench coach. The Cubs took National League Central Division titles in each of Trammell’s first two years there. Under manager Kirk Gibson, his former teammate, Trammell was the bench coach of the Arizona Diamondbacks from 2011 to 2014. After Gibson was fired, Trammell returned home to Detroit to become a Special Assistant to the General Manager with the Tigers. An early version of this biography appeared in "Detroit Tigers 1984: What A Start! What A Finish!" (SABR, 2012), edited by Mark Pattison and David Raglin. Anderson, Sparky. Bless You Boys: Diary of the Detroit Tigers 1984 Season. Chicago: Contemporary Books. 1984. Janoff, Barry. Alan Trammell: Tiger on the Prowl. Chicago: Children’s Press. 1985. Thorn, John, and Pete Palmer, eds. Total Baseball: The Official Encyclopedia of Major League Baseball (4th ed.). New York: Viking Press/Penguin Group. 1995. Sullivan, George, and David Cataneo. Detroit Tigers: The Complete Record of Detroit Tigers Baseball. New York: Macmillan. 1985. New York Post, June 1996. San Diego Union Tribune, January 2002. Sports Illustrated, September 12, 1983; May 28 and October 22, 1984; August 17, 1987. The Sporting News, July 1977, June 1979, September 1980, and May and September 1984. USA Today, July 1991, August 1992, September 1995, October 1996 and October 1998. National Baseball Hall of Fame and Library research.